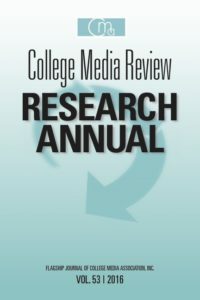 Volume 53 for CMR contains peer-reviewed research relating to college media and its practitioners that was published by the College Media Review (CMReview.org) during the 2015-2016 Academic Year. To download a copy of this volume, CLICK HERE. For previous editions of the Research Annual, see the “Archive” link at the top of the home page.